In a medium saucepan over low heat, melt butter with lima beans. Coook, stiring gently, until lima beans are heated through. 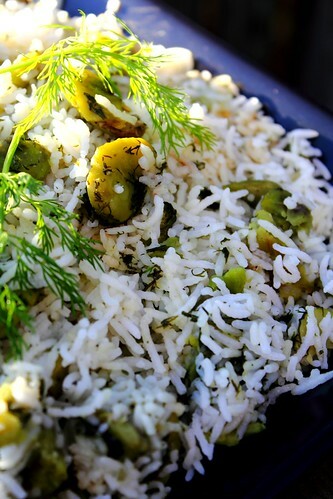 Combine lima bean mixture, dill weed and basmati rice. Mix lightly to avoid breaking the rice and mashing the lima beans. When thoroughly combined, transfer to serving dish. Top with saffron water. one of my favorites too! awesome idea about the gheimeh…I’ll see about getting the recipe.